Yoga Perera is a living legend in car racing in Sri Lanka. His trophy room is proof positive of that. Yoga has a special memory attached to each of the almost thousand trophies that are kept hidden away in the upstairs of his house. He has been racing since 1981, as a young boy just out of school and helping his dad in the family construction business. Yoga used all his savings and bought his first mini minor and started racing. 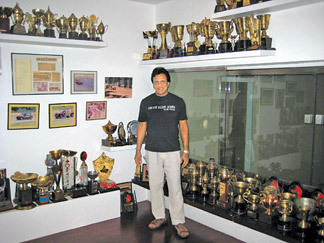 His parents did not know what he was upto until he brought home his first trophy from the first race that he raced in. From that time, his late mother was his biggest fan, not missing a single race. Sri Lanka car racing is still at the amateur level. Yoga feels that the petrol rations of the late 1970s was the biggest obstacle to taking Sri Lanka racing to another level. All road races had come to a standstill. But come 1981, and it was car racing time again and Yoga was determined to make his mark. Yoga says, he has always been crazy about speed. This was something close to his heart even while he was in school. Even now, when he gets behind the wheel of his mini minor, he feels that he has come home. He used just the same little car for racing as well as for driving regularly as he could not afford another special race car those days. He had spent every cent that he had on his little racing car. Today, he has three special cars to race and his friend helps with all the preparations of the cars for races. Early on, Yoga realised that the important qualities for a good race driver are very good reflexes. To improve his reflexes, he has been playing badminton at least four times a week. To improve his stamina which is sorely needed for the enduring laps of the race, he realised gym training was a must. Now he is very happy that it has worked both ways. “I wanted to improve my stamina and reflexes and so I go for badminton and gym. And because I go for badminton and gym, I am able to race better. Whichever way you look at it, it is a win-win situation for me,” says Yoga happily. It has been a glorious road for Yoga and racing. With every race he absorbed more and fine tuned his techniques. He has a completely calm and easy going personality, perfectly suited to a racing driver. None of the hot passion that makes today’s youngsters drive like a maniac. He has raced in all the six circuits in Sri Lanka, but finds the Foxhill climb one of the best race tracks. “Racing is a sport of strategy and planning,” says Yoga. Yoga raced in the Carlton Night races last week end. “This was something the whole motor-racing circuit and the country itself was looking forward to,” he says. It was one of the most glamorous events held in Sri Lanka. It was almost like a carnival for the whole country. “For an event like this to be pulled off with success shows that our next step is International racing,” says Yoga. Only thing he is concerned is that other than a few promising youngsters like Parindu Peiris, Shehan de Silva and Romani de Silva, to name a few, the younger generation lacks discipline and has a tendency to cheat by working on the shortcomings. “For eg. here in Sri Lanka it is not possible to scrutinize the car’s engine. So, in a 1000cc race category, the young drivers are quite capable of fitting in 1500cc engines, very much like athletes taking dope,” says Yoga. Yoga himself was a victim of lack of discipline last week-end as his car was knocked from behind and he spun off the track and fell into a culvert and could not finish the race. 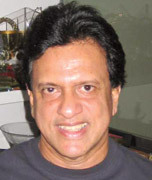 “If we can clean up motor sports in Sri Lanka, by disciplining our young drivers and stopping inter-club politics, motor racing can scale great heights,” says Yoga the SLARDAR- which is the controlling body of motor sports, has proven with the Carlton Night races that they can pull off a great job when it comes to organizing. Yoga is keen that his two young sons get a good education before they take up motor racing. They may do it if they wish, he says. But they have to work hard for it. I am not going to give them a racing car and say you go and race putha. Somehow or other you must win. No way. That is why most of our young drivers, drive like maniacs now. I don’t blame the undisciplined race driver of today. I blame his parent for handing things over in a platter, he says. Yoga is passionate about motor racing and can see a very bright future for Sri Lanka motor sports and he is cheering it on.